We'll start in Japan, with JOLED. In late 2017 JOLED announced it has started commercial production of 21.6" 4K OLED panels - and so the Japanese display maker became the first company to commercialize ink-jet printing for OLED production. 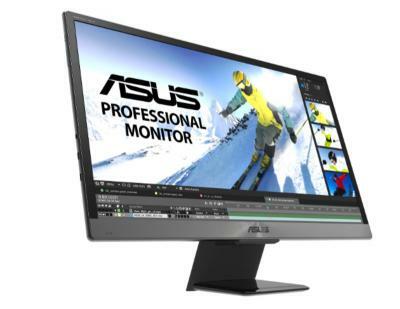 In early 2018 Asus announced the first product to utilize these panels, the ProArt PQ22UC which will hopefully ship by the spring of 2018. 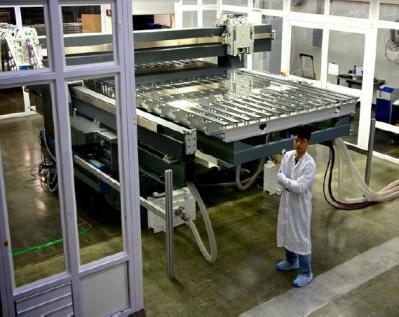 JOLED's production capacity is not large as the company is still using a pilot-scale line, but JOLED is seeking to raise $900 million to support its plan to start mass producing OLEDs in 2019. According to reports, JOLED is well on its way to receive the financial support it needs by March 2018. JOLED (Japan OLED) was established in August 2014 by Japan Display, Sony and Panasonic with financial support from Japan's INCJ. JOLED based its technology on the process and equipment developed by Panasonic, combined with a device structure (based on an IGZO backplane) it inherited from Sony. JOLED is using Sumitomo's PLED emissive materials. LG Display is currently producing WRGB OLED TVs panels using an evaporation process, and it was reported a while back that LGD considers ink-jet to be a viable route towards lower cost production (which may also lead to more efficient and higher quality direct-emission RGB OLED TVs). LGD has already setup a pilot 8.5-Gen production line and has developed a 55-inch printed OLED prototype (this was not publicly shown yet). LG is reportedly using Japan's Tokyo Electron printing equipment, and soluble emissive materials supplied by Merck. Samsung is currently not producing OLED TVs, but following a large drop in its premium TV market share (lost mostly to LG's OLED TVs) the Korean company is looking to find a next-generation TV technology to bring it back on track. 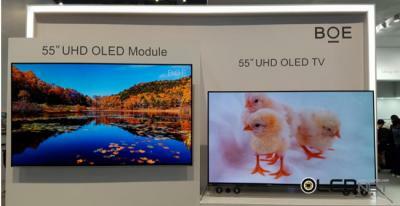 Samsung seems to be focused on two technologies, Micro-LEDs and ink-jet printed OLEDs. 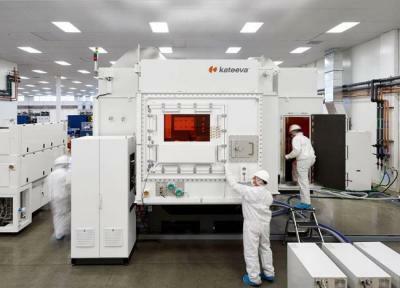 Samsung is using Kateeva's printers, and emissive materials supplied by DuPont, to develop a 8.5-Gen production process with a goal to produce 55-inch panels. It is not clear what is Samsung's current situation, but in 2016 Kateeva's Korea VP stated that he expects Samsung to start mass producing OLED TVs using Kateeva's equipment by 2018. Chinese companies are also looking at ink-jet printing as a viable goal towards OLED TV production. In 2016, TCL's CSoT (66%) and TianMa (34%) established a company called Guangdong Juhua Printing Display Technology as an "open-innovation platform" to develop ink-jet printing of OLED panels. We do not know the equipment and materials selected by the Chinese OLED makers. In 2016, however, Germany's Cynora announced that it will collaborate with Juhua Printing and supply it with TADF OLED materials. TCL says that it expects to begin mass production of OLED TVs using ink-jet printing in 2019. Interestingly TCL sees another advantage of ink-jet printing in that it will help the company accelerate its QLED Printing technologies for post-OLED next-gen displays. China's largest display maker, BOE, is also active with ink-jet printing, and according to reports the company is establishing an R&D production line (in Hefei) that uses Kateeva's inkjet deposition equipment. Most people consider ink-jet printing to be only suitable for large-area OLED production (TVs, monitors), as the high-densities required by smartphone and other mobile device displays are not achievable using ink-jet printing (which is currently limited to around 250 PPI, enough for a 8K 55" display but not for smartphones). Korea's UniJet, however, believes otherwise, and the company claims that this technology could in fact achieve up to 550 PPI by 2020, which will make it useful for smartphone display at that time. This will certainly be an interesting development. Ink-jet printing is already used to deposit the organic part of the thin-film encapsulation layer in most flexible OLEDs. Kateeva launched its YIELDJet Flex in 2014 specifically for this application and in 2016 the company said it has earned a "commanding lead" in the organic TFE deposition step for flexible OLED production.